The traditional shape of the Pashka is a sort of pyramid. The X B stands for Христосъ Воскресe, which means “Christ is risen” in Russian. 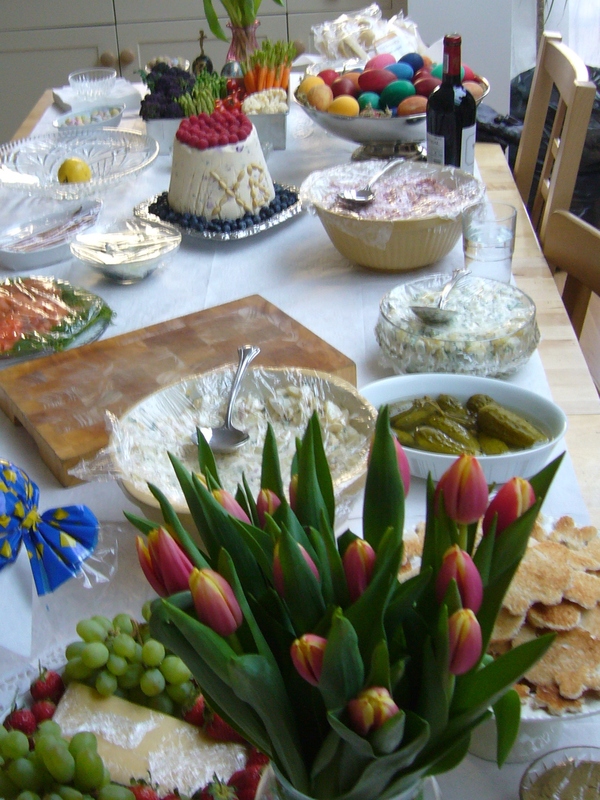 The little jewels you can see through the cheese are dried cherries, blackberries and currants. 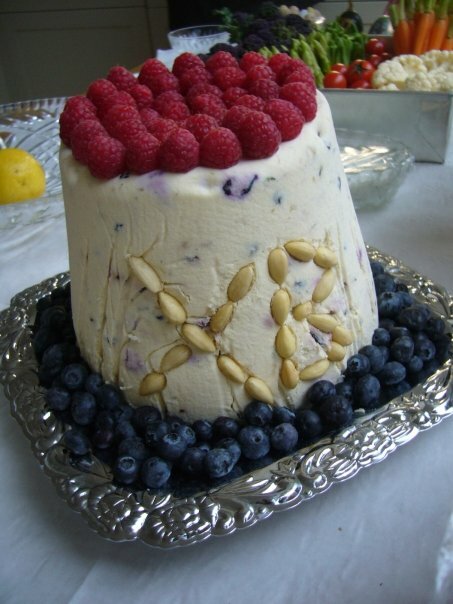 I love serving this with fresh berries – they compliment the creamy joy very, very well! This is also one of the easiest desserts you can make. You will also need a flowerpot to use as a mold. I use plastic and sterilize it in the dishwasher. You then need more muslin, doubled over to line the flowerpot. Don’t worry – you can wash the muslin and re-use. 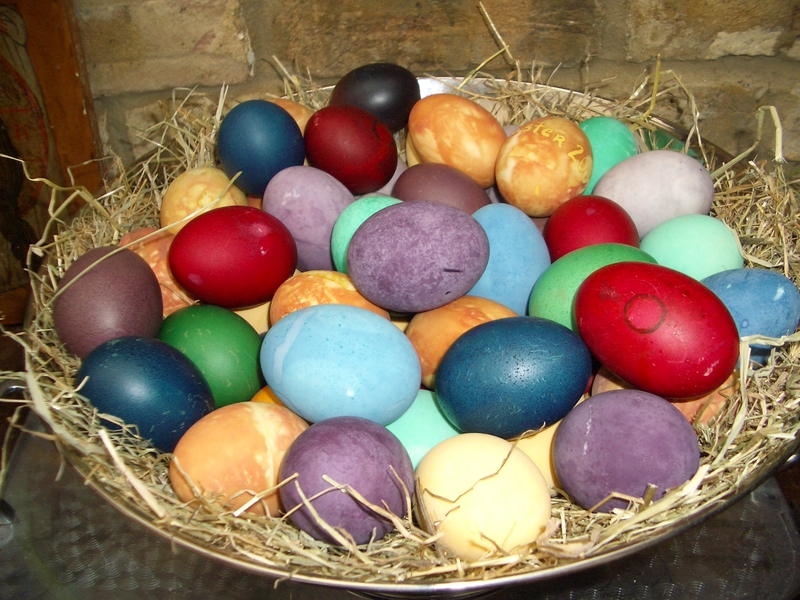 I love a big Easter, and an Easter table with the Pashka and a big bowl of colored hard boiled eggs. 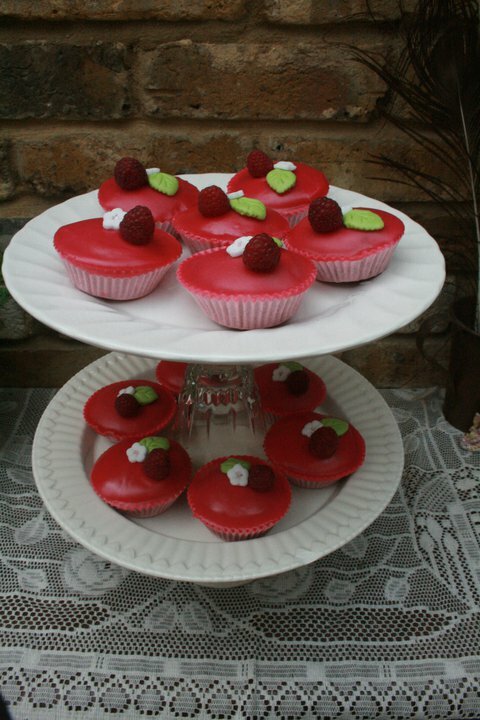 I first made raspberry cupcakes last year, with a basic vanilla cupcake recipe and fresh raspberries juiced into a fondant icing. This was, if I recall, my first attempt at dipping cupcakes using a pouring fondant, or dipping fondant. The fresh raspberry juice gave a beautiful taste and colour to the icing, and turned out to be surprisingly easy. Once your icing is at the right consistency, pour into a bowl and dip the cupcakes in, a little further than you would think to cover the entire top. Not too shabby! 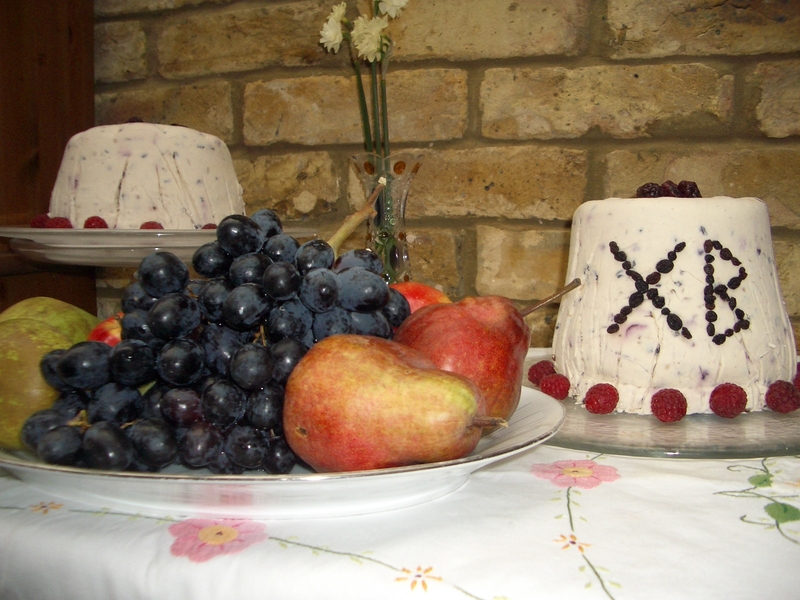 A fresh raspberry on top with fondant flower and leaf – both made with a cutter. Although they were good, all the raspberry taste came from the frosting. 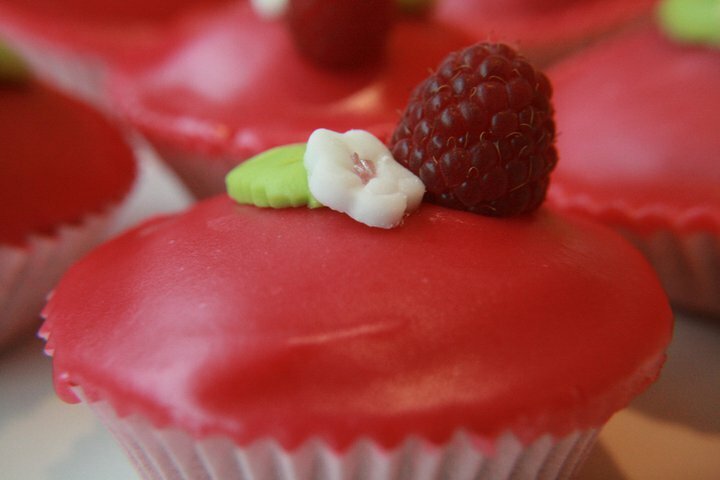 Baking fresh raspberries into cupcakes isn’t so successful – they loose their beautiful colour, the taste isn’t as good and baked fruit can make small cupcakes very soggy. 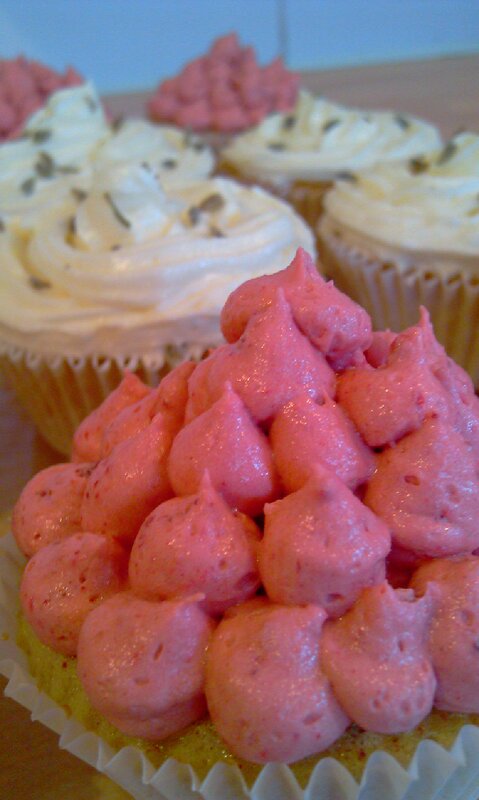 So the last raspberry cupcakes I made I used freeze dried raspberries. 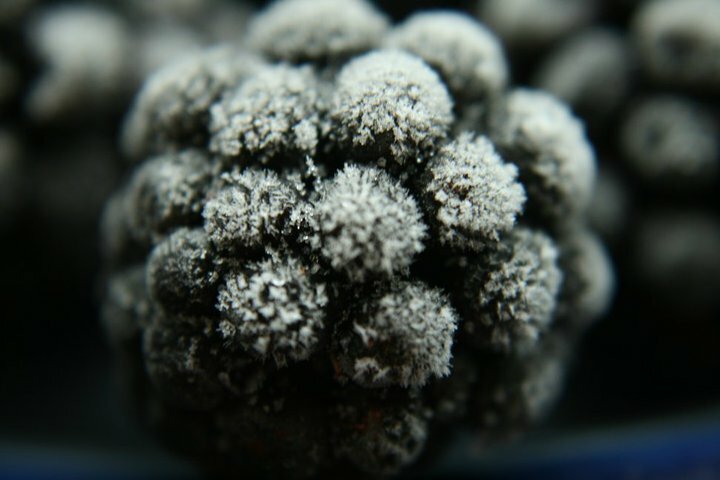 Freeze dried berries and fruits are amazing to bake with – it keeps its colour and the taste is very intense. I topped the cupcakes with butter cream icing, to which I added a good handful of freeze dried raspberries that had be ground to a rough powder with a mortar and pestle. 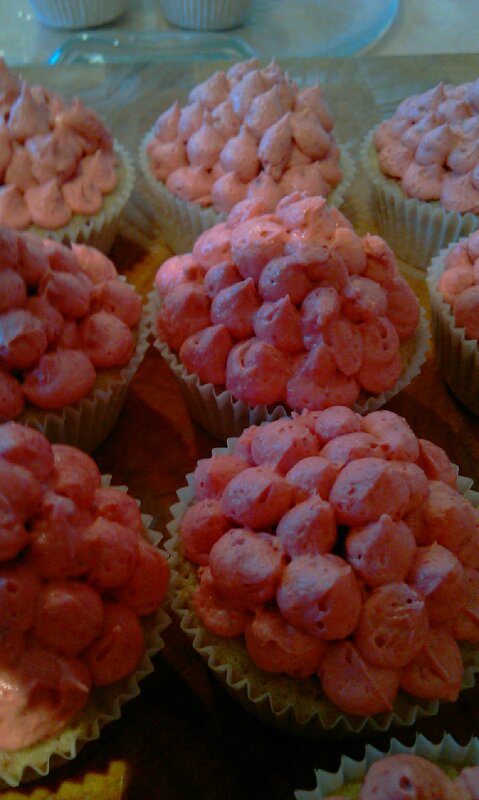 Then I piped them to look (kinda) like raspberries. The ones behind were lavender with a butter cream. I halved the cake mix and instead of adding the broken up rasberries, I added some food grade lavender, and some lavender syrup. The frosting was half the plain butter cream, again substituting the raspberry for lavender. A raspberry twist on the classic Victoria sponge, which also makes great cupcakes. 1. Preheat oven to 180F/350C and prepare 2 x 6 inch sandwich tins, with baking parchment or 12 -15 cupcake cases. 2. Cream the butter and sugar well, until pale and fluffy. 3. Add beaten egg, a little at a time, and if mixture threatens to curdle, add a little of the flour (1-2 tablespoons), and add the vanilla. 4. 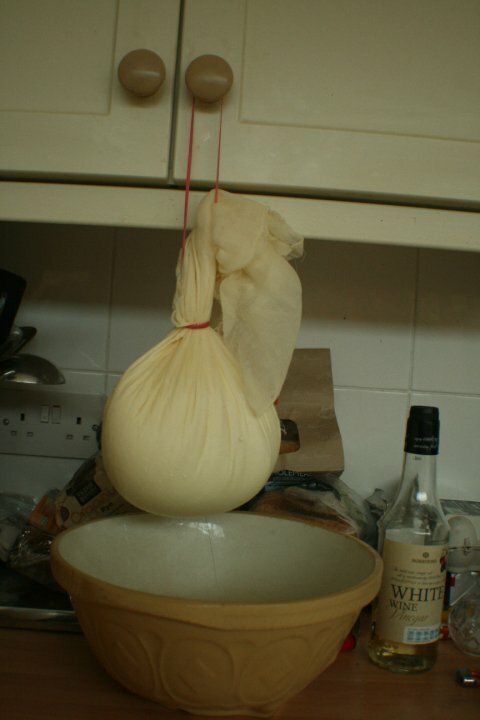 Fold in the remaining flour, and add enough of the water so that the mix is of a slow dropping consistency. 5. Divide mixture between tins, or half fill cupcake cases. 6. Bake sandwich tins for 20 mins, cupcakes for 15-18 until well risen and a skewer comes away clean. 7. When cool, decorate with raspberry butter cream frosting, and try the cake with fresh raspberries and cream in the middle. Every year we trek to the local park for all sorts of foraged goodies – including beautiful blackberries. They freeze very well. First, freeze them on a baking tray, in one layer, not touching each other. 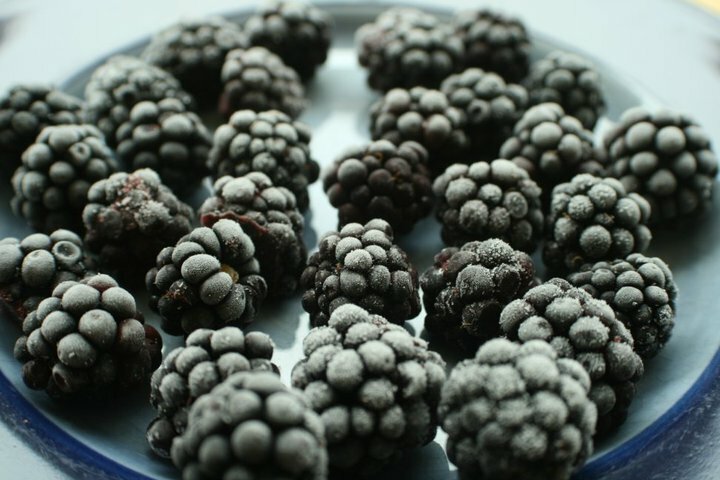 Then, once frozen, transfer to freezer bags for blackberry joy all year round!